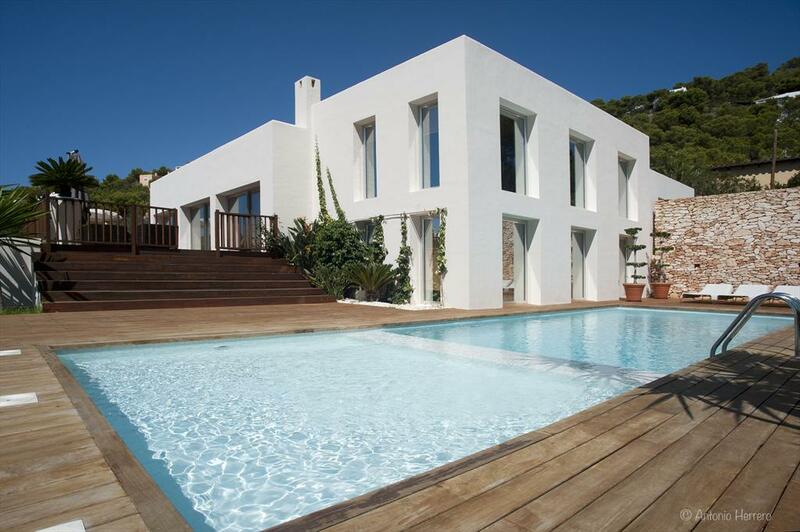 Ibiza, or Eivissa, is an island in the Mediterranean Sea and has a surface area of 575 km2. 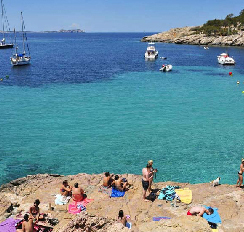 Together with Formentera, it is one of the two Pithyusans (pine tree islands), and as such forms a part of the Balearic Islands: Mallorca, Manorca, Formentera, Ibiza, and many smaller, uninhabited islands. 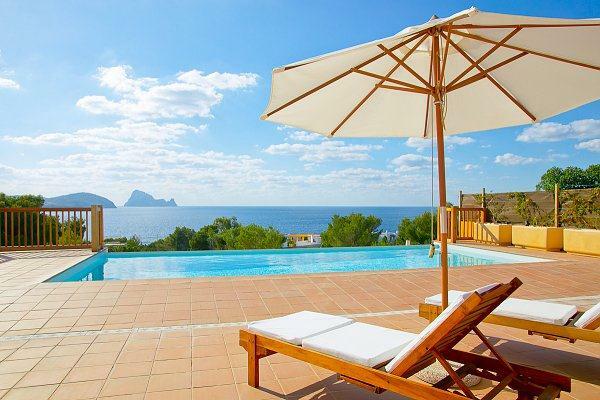 Ibiza is the most visited island in Spain and is only about 41km long and 20km wide, which means that, no matter where you wish to go on the island, it’s never more than a half hour drive. 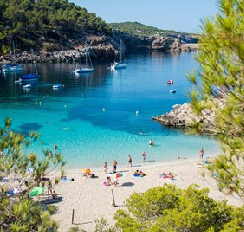 Ibiza is not only world-famous because of its bustling nightlife, but also because of its many fantastic beaches with isolated, sheltered bays and coves where you will find yourself in paradise while swimming in turquoise, crystal-clear waters surrounded by high, magnificent cliffs. 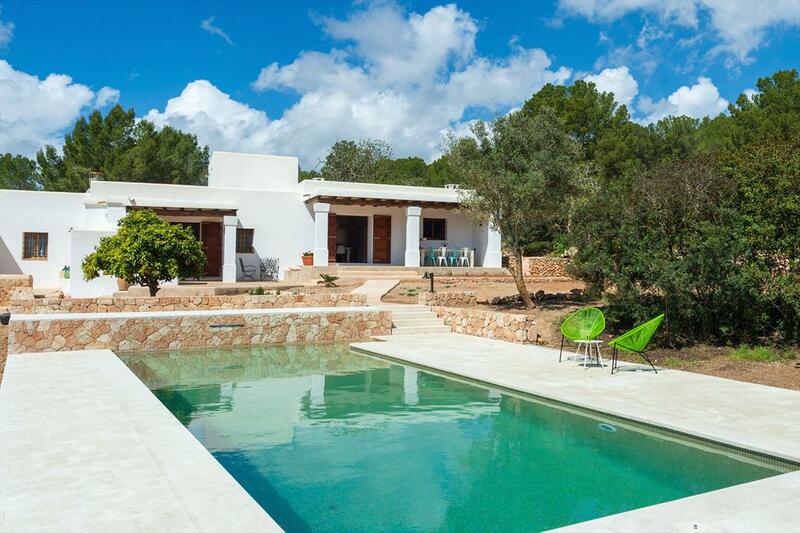 These beautiful natural conditions and the tolerant lifestyle of the Ibicenco, the inhabitants of the island, were part of the reason why Ibiza saw such an influx of mainland artists looking for a safe haven in this paradise at the end of the 1950s. The trek to Ibiza took decades and resulted in a lively coast scene, which inspired every migrant in his own way. Some even stayed here to live. Hippie markets are held every week at multiple places on the island, and shopping is fantastic because Ibiza is always ahead of the curve when it comes to trends. 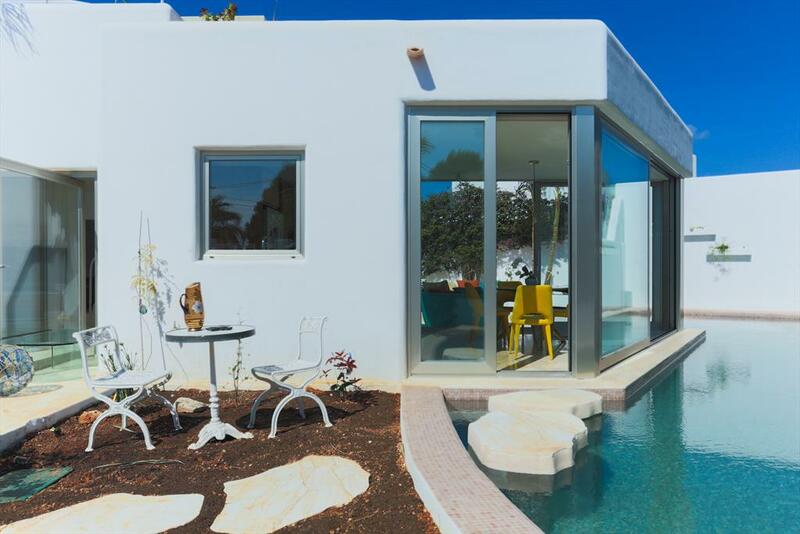 So if you are interested in clothing or interior decoration advice, you will find only the newest of the new on Ibiza. 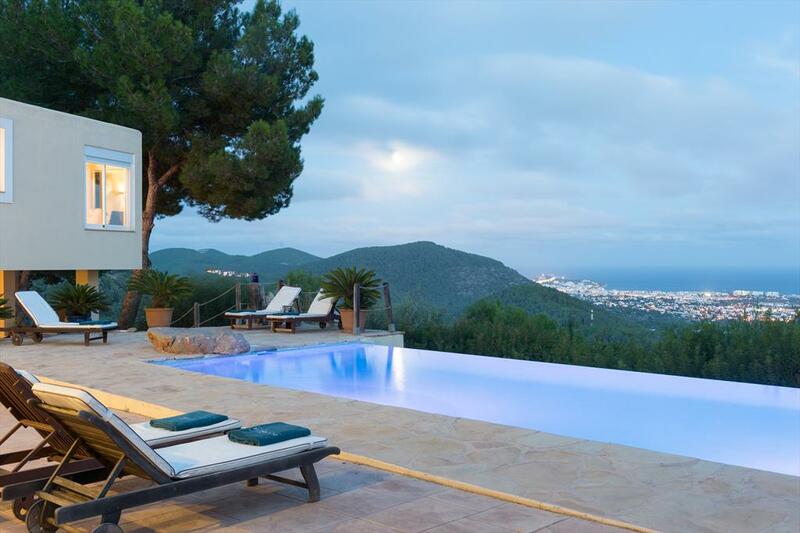 Ibiza is bustling and charming, romantic and enchanting. It truly is a one-in-a-million island! Ibiza was conquered in 1235 by Jacob I the Conqueror (Jaume I). 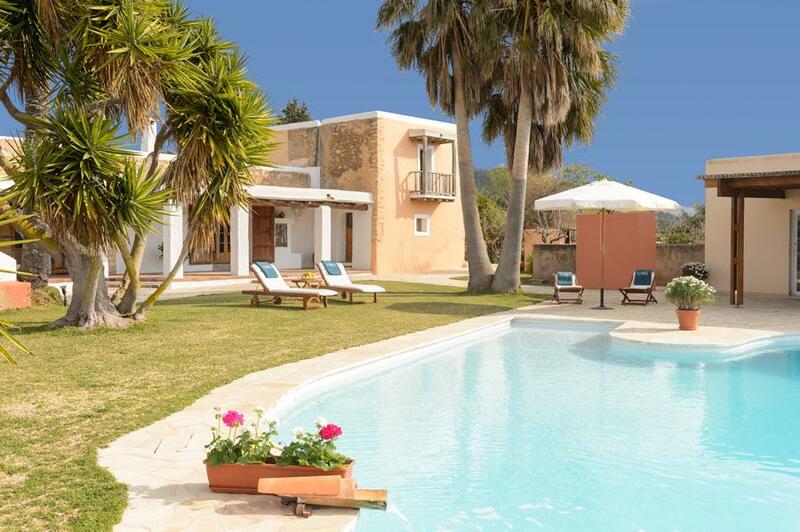 This historically important island has, through the ages, been occupied by multiple people. In these cases, violence was by no means restrained. The diverse defence towers point to a tumultuous past. Sa Caleta, for instance, is a place where the remnants of a Phoenician civilisation are preserved as part of a UNESCO World Heritage Site. 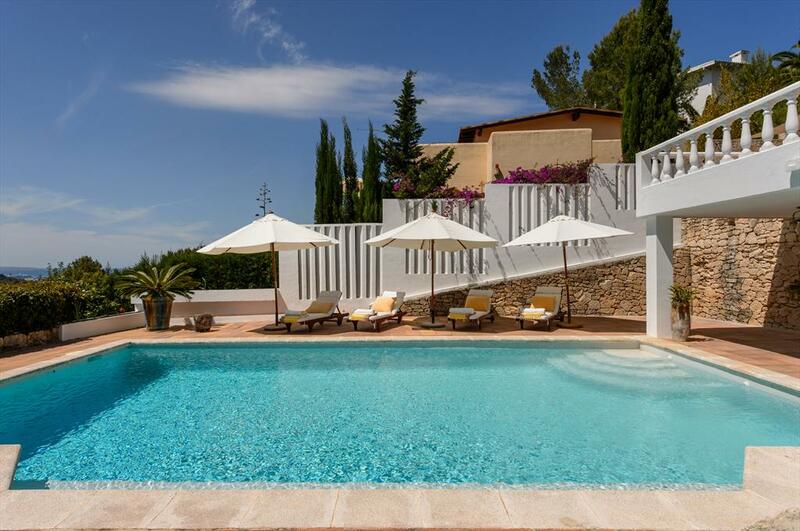 Ibiza is, hands-down, the vacation and leisure island. 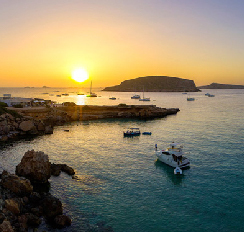 For years, the island has been the meeting point for party-goers of all ages and from all around Europe. 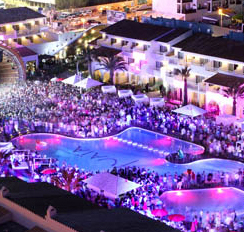 In the extravagant nightlife of Ibiza City, everyone can live his dream with the enjoyment of seeing and being seen. The sympathetic city offers many bars, restaurants, terraces, and, of course, famous discotheques that don’t close until sunup. 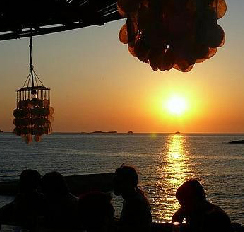 Not many other places in Europe offer so many trendy night clubs as Ibiza. 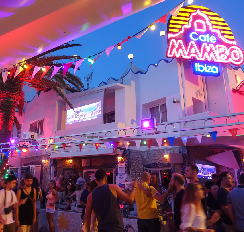 The bustling nightlife is especially marked in San Antonio -where the gay scene is quite popular-, and in Ibiza City, in the area around the harbour. World-famous clubs and DJs entertain thousands of party-goers who fill up the dance floors every year, including well-known celebrities and, of course, the chic de la chic. 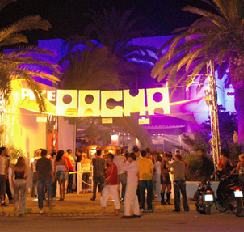 The large dance palaces of the island are, amongst others: Eden, El Devino, Space, Amnesia, DC10, Ushuaia and of course Pacha and Privilege, the largest club in the world, with a capacity of 10,000 guests. 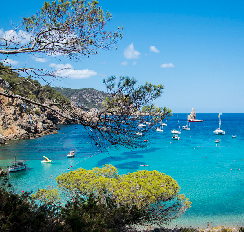 But Ibiza has so much more to offer than just going out and parading around. The island has an abundance of beautiful beaches, ranging from very busy to unadulterated and quiet. 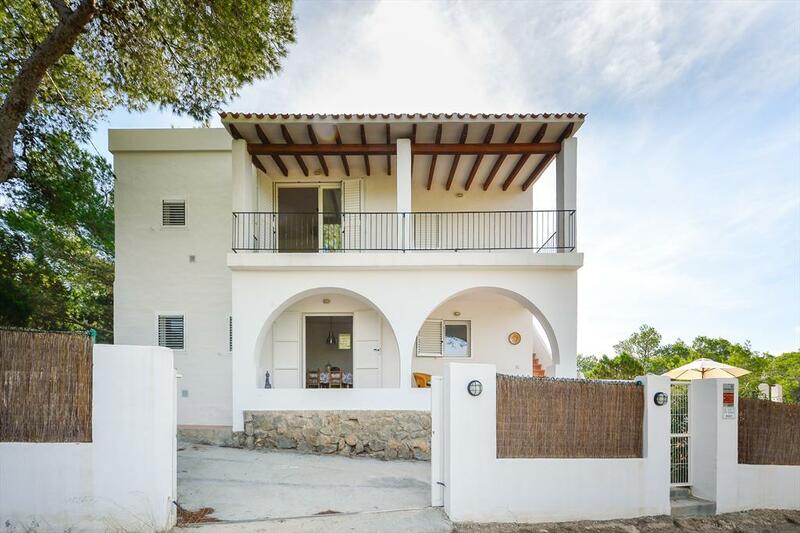 Ibiza has beautiful nature that lends itself perfectly to a day with a rental car or an organised Jeep safari, exploring the narrow plazas with crooked streets and picturesque squares. 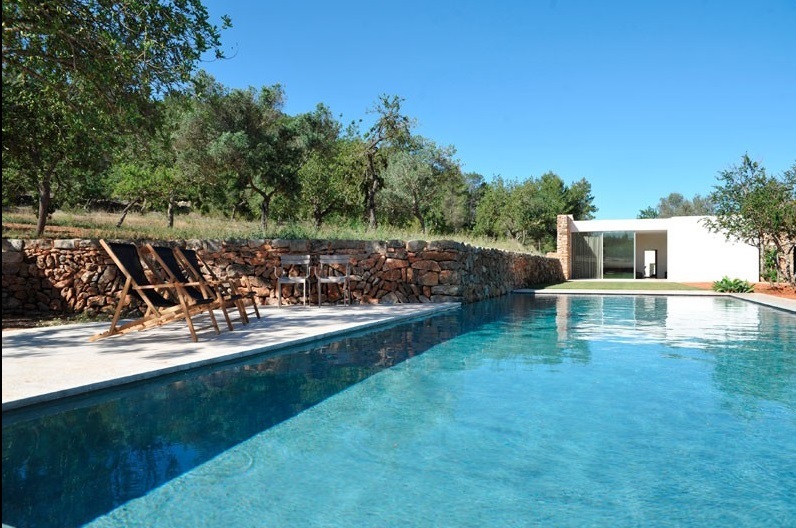 Ibiza is also a great vacation spot for families with children. The beaches are wide and long and generally lie on the sea. There are many activities that are fun for children to undertake; like small trains that run through the tourist spots, water parks, zoos, and aquariums. 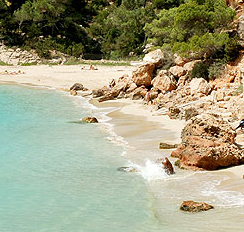 Ibiza has 50 beaches, of which the Platja de Ses Salines and the Platja d’en Bossa are the most well-known. 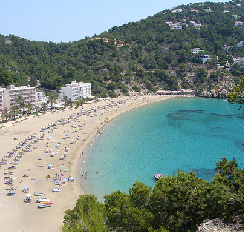 Both are southwest of the capital of Ibiza City and are long, broad, and covered in fine white sand. Typical of the beaches are the chiringuitos (beach shacks) where you can have a drink and a delicious bite to eat. 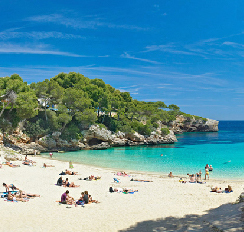 On top of that you will also find on Ibiza many smaller beaches and even deserted bays that you can only get to by boat. 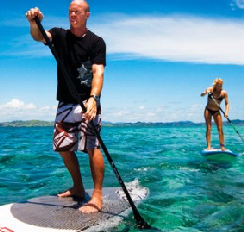 Most beaches offer water-sport opportunities such as jetskiing, surfing, and boat rental. You will often also find a beach shack where you can have something to eat or drink, as well as other facilities such as sun chairs and parasols for hire. 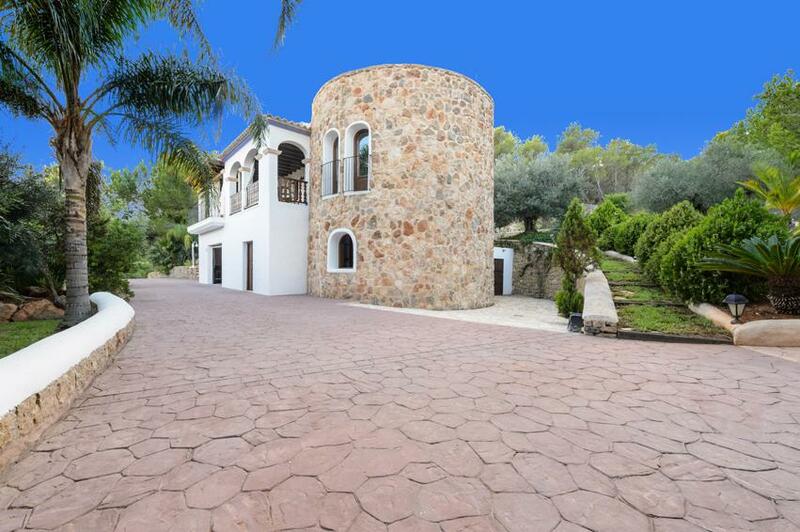 Not far from Sant Antoni lies the Punta de Sa Galera. While there is no sand here, you can still find super clear water, enormous rock plateaus, and a mud spring with mud that –according to the locals– has healing powers. 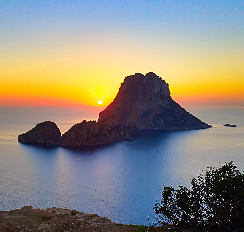 Ibiza offers some of the most beautiful sunsets in the Mediterranean, a daily event which draws thousands to witness the unbeatable drama laid on by nature. 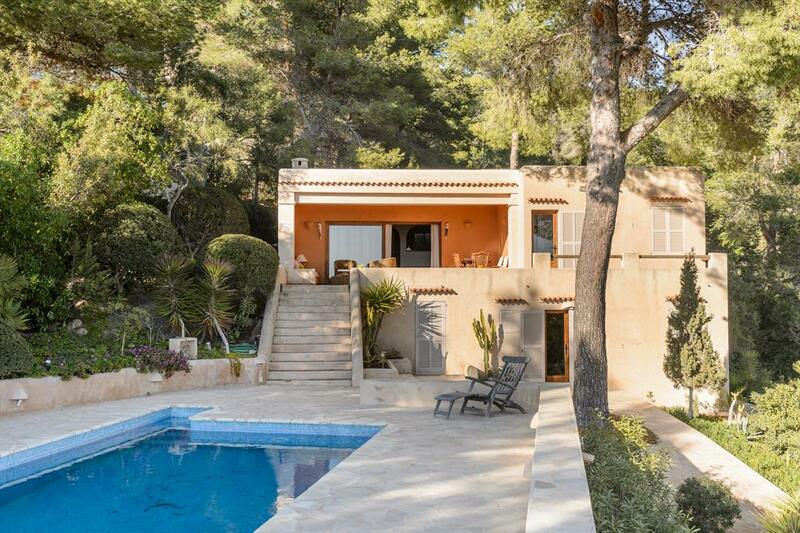 Ses Variades in Sant Antoni was the first to pair chill-out with this special moment, and the music of the seashore venue with bars like Mambo and Café del Mar is now known across the world. Famous DJs try out new rhythms on a spellbound audience, reaching their climax as the sun makes a majestic exit by the western isles, a thousand hearts beating as one to a round of applause. A good way to visit all the things worth seeing on the island is with a rental car. With your own car you can easily go from point to point when and where you want. There is enough to see, from mysterious caves, salt mountains, quiet towns, medieval churches and hippy markets to undiscovered bays and natural beauty. Some suggestions: the citadel above “the old town” know as Dalt Vila, the beautiful villages of Santa Gertrudis and San Augustin, the Phoenician town of Sa Caleta, which has also been declared World Heritage Site, the salt plains of Salinas and Atlantis, a magical and idyllic (secret) spot on the West coast and the remnants of an Arabic irrigation system, named Seis Feixes, forming a protected shelter for flamingos, who brood there from the latter half of April to the end of May. The most important attractions are also offered by the travel industry by means of organised bus excursions. 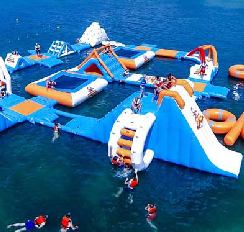 The island offers a choice of sport possibilities. 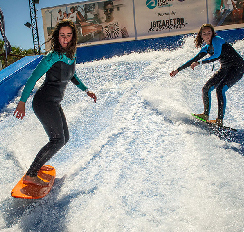 The beach allows for different water-sports opportunities, among them jetskiing and surfing. 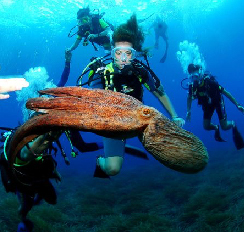 Ibiza also has a large amount of sailing and diving schools. 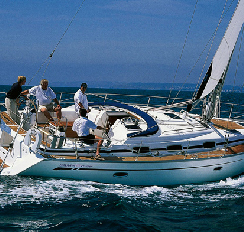 And for real enjoyment you can rent a motor or sail yacht for the day. Strolling and biking are good options to discover the beauty of the island. 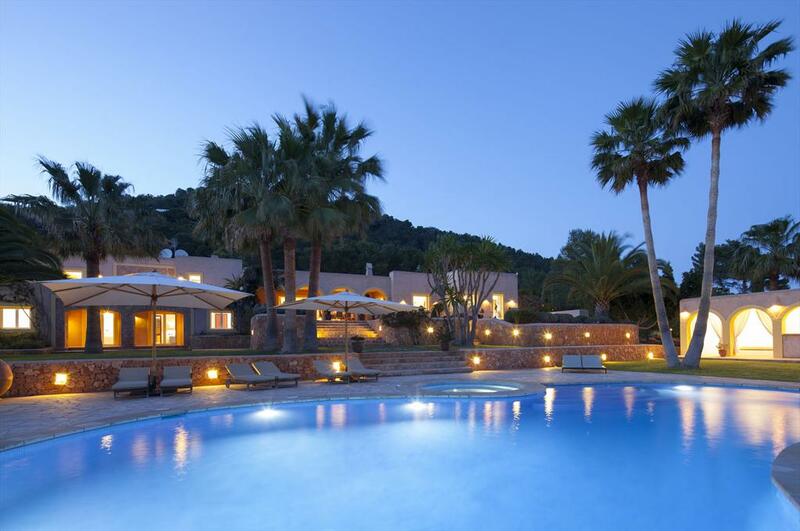 Horseback riding and golf are also a part of the sport opportunities on Ibiza. 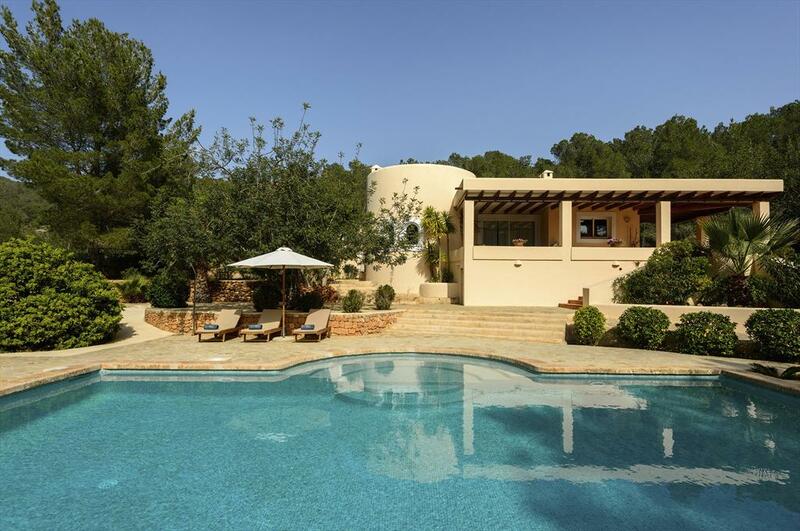 The golf terrain is about 7 kilometres from Ibiza City. 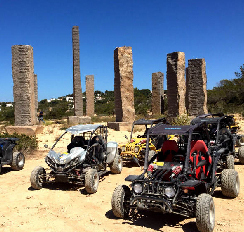 Ibiza also has much to offer the adventurous vacation-goer: bungee jumping, parasailing, kite-surfing, hot-air balloon rides, jetskiing, and mountaineering. On Ibiza you can find all the kitchens from around the world, from French, Italian, and Dutch to Mexican, Indonesian and Japanese. 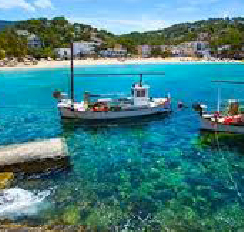 Ibiza's local cuisine is typically Spanish/Mediterranean and includes dishes like Bullit de Peix (fish stew), Paella and Arroz de Matanzas (rice with pork), but the island is also famous for its excellent grilled fish, meat and tapas. 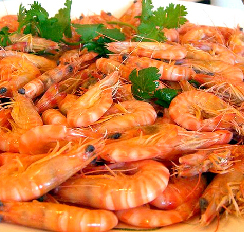 In Ibiza City you will find the best tapas bars and authentic Spanish restaurants. On top of that, the tourist centre of course also features all the fast food chains. In the restaurants and pubs on the beach the menu often offers a choice between a real American hamburger or baked fish, fresh from the sea. 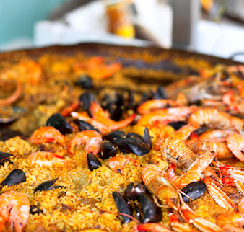 In other words, Ibiza has the right solution to every culinary preference. In Ibiza City you can, of course, eat at a regular North European hour (between 6 and 7PM), but it becomes particularly cosy and fun after about 9PM, when the locals begin to shuffle in. 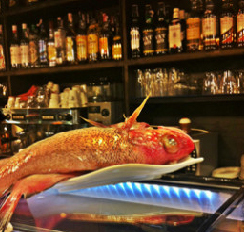 One of the best tapas restaurants in Ibiza City is the Taberna Lizarran. 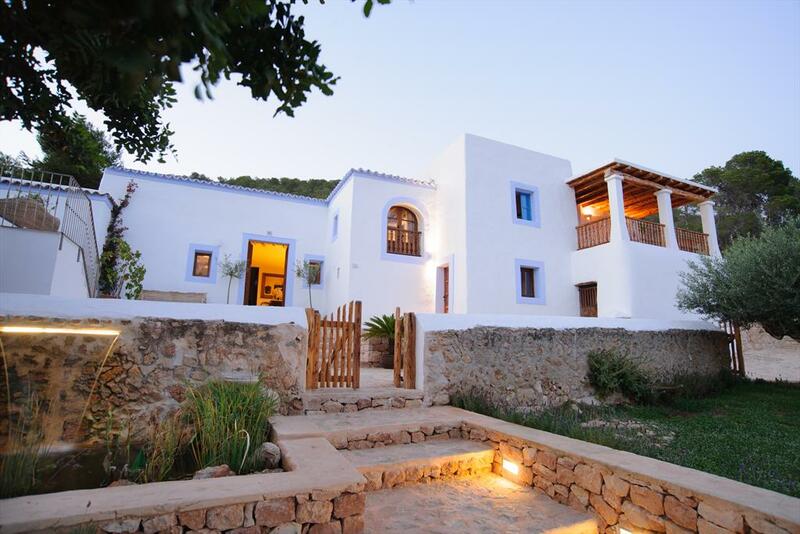 Apart from Spanish (Castellano), the native dialect that is spoken on Ibiza is Eivissenc. 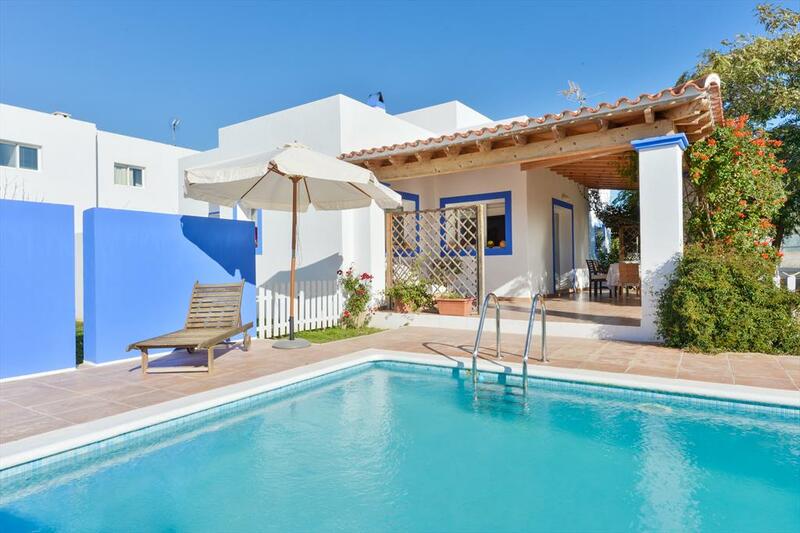 But don’t worry, because of the influence of tourism and expatriates living on the island, other languages like English, German and Italian are also spoken. 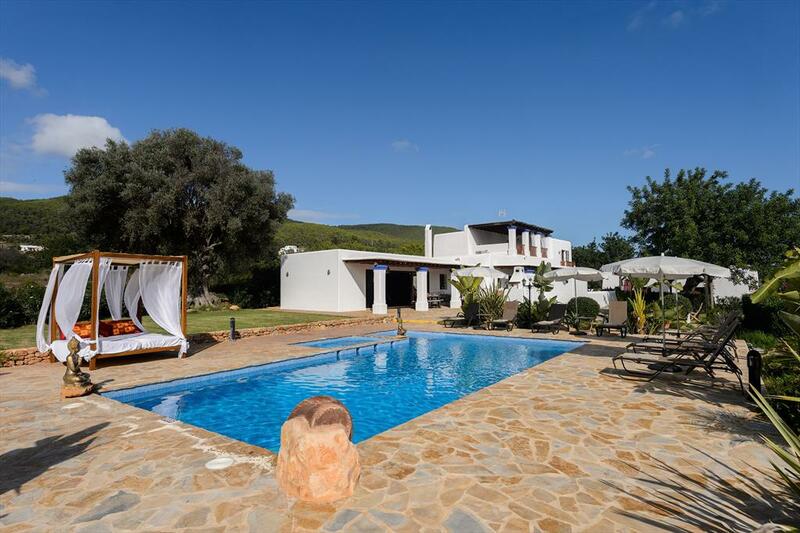 The Holiday houses, vacation villas, and fincas are spread over the rolling landscape of Ibiza and are always close to the beach and leisure possibilities. Ibiza has its own international airport, but the island is also easily reachable from the mainland. 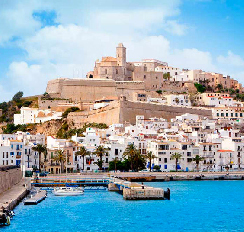 There are ferries from Barcelona, Mallorca, Denia and Valencia going directly to Ibiza town and San Antonio. Ferries to Formentera leave several times a day from Ibiza, San Antonio and Santa Eulalia. Public buses cover a large part of the island. There are also a lot of taxis on Ibiza but beware that outside the urbanisations most streets do not have street names and house numbers, so please check beforehand if the taxi driver knows the place you want to go to. Generally speaking, the electricity grid runs on 220 volts, although you may sometimes encounter 125 volt plugs. Normal hours of business are from 9:30AM to 1:30PM and from 5:00PM to 8:00PM. However, supermarkets and shopping centres are generally open from 9:30AM to 9:30PM. The shopping centres are also usually open on holidays. 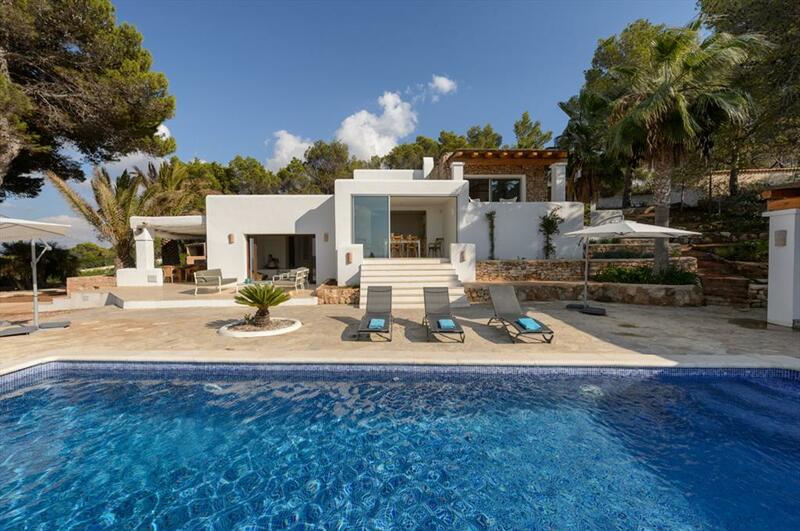 Ibiza has a subtropical Mediterranean climate with warm summers, during which the daily high in July and August can reach above 35 ºC and the evening low is always above 25ºC. 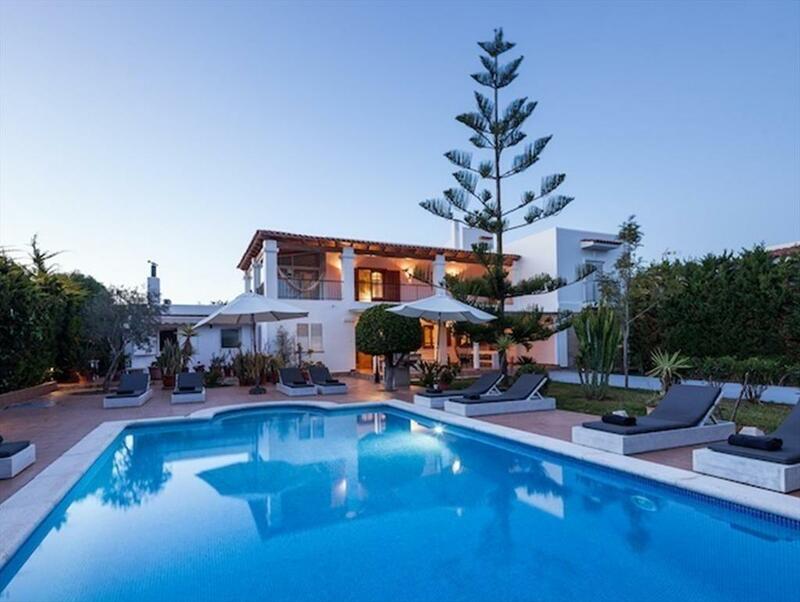 Even in the winter the average daily temperature is a pleasant 15ºC. The summers can sometimes bring overcast skies, but this does not mean it will necessarily rain. Besides, a bit of rain is more of a breath of fresh air after the many warm days full of sun. 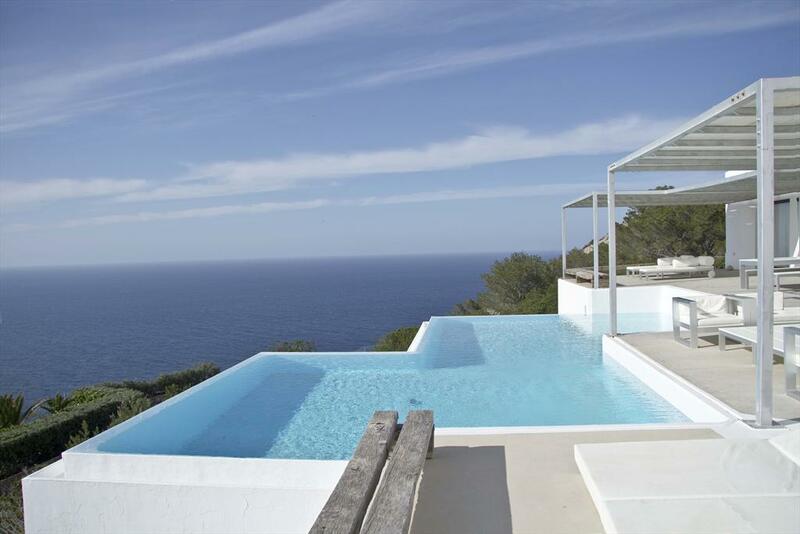 With 2800 sun hours and an average of 70 days of rain per year, Ibiza has an attractive holiday climate.